AMD is gearing up for quite a comeback in 2017 with its x86 Zen architecture and while most of our audience are concerned with the desktop variants, the server variants constitute a part of the company’s lineup that is just as important (if not more). 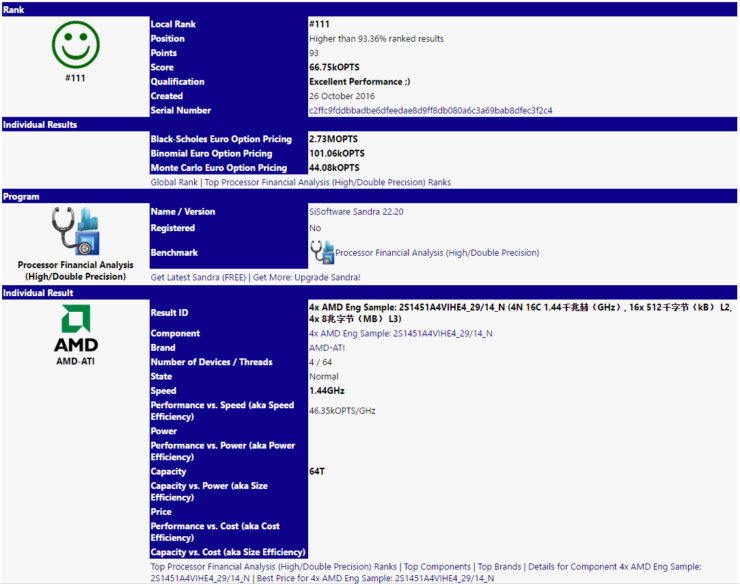 We have already heard of AMD’s server platform codenamed Diesel, which features the Naples variant of the Zen processor, and this has just received its second iteration of benchmarks courtesy of the SiSoft Sandra database. This particular variant has a base clock of 1.44 Ghz and a turbo clock of 2.9 Ghz (it can be deduced from the 29/14 suffix at the end of the identification tag). This is also a dual socket result as denoted by the 2S portion of the name tag so we are dealing with two 32 core processors (each having two 16 core dies on board). AMD’s trademark lego-like build philosophy and Zen’s unique MCM (Multi-Chip Module) capabilities are apparent here. The benchmarks given above confirm some interesting specifications of Zen architecture. First of all, as we have been saying for the past year, the full Naples configuration will have 16 clusters of 512 KB L2 and 4 clusters of 8 MB shared L3. The PCI bandwidth is shown as 310 MB/s and the cryptography benchmarks are clocking out at 170 MB/s. These values are not up to par of what should theoretically be the performance of a 64 core setup so it is a fairly safe bet that the benchmark is not utilizing the processor properly here. As we have told you before, Zen will introduce some brand new cryptography tricks so it is probable that the benchmark is not able to utilize these new abilities. The Processor and Multi Media portion shows a 643.37 Mpix/s performance which is fairly within range. Finally, processor financial analysis at double prevision is 667,500 OPTS. This is pretty decent performance and since AMD’s value proposition is usually very high would be able to target financial institutions like Thomson Reuters. Some of our readers might remember that we have actually seen this particular variant once before, namely in the form of Geekbench leaks that occurred a while back. Now the SiSoft Sandra entry lists 16 cores for this particular processor, but that is actually the separate dies being detected. Since there are 4 dies in play here we are actually looking at a total of 64 cores. This amount is consistent with what we saw in the Geekbench benchmarks but it’s worth noting that the scalability of Zen Naples platform goes all the way from 16 cores to 64 cores and due to the ambiguous reporting patterns of these benchmarks its usually very hard to tell which specific variant we are dealing with. I also have another update to give you. 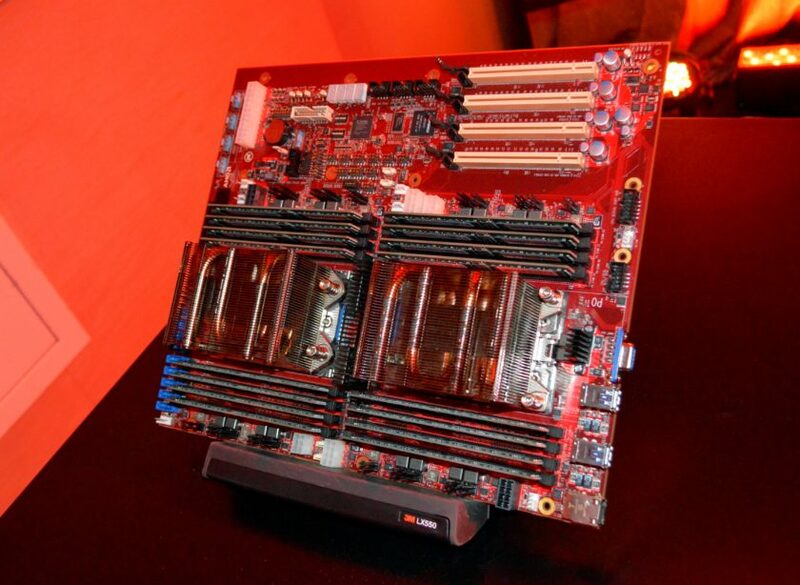 The motherboards for AMD’s Diesel platform have been ready for a very long time (the first shipping manifests date back to 12th August and contained the FOC tag) and it is abundantly clear that AMD is wrapping up on the final testing phase of these boards and gearing up for launch next year. These benchmarks are not indicative of the final product since these are obviously from external testing by partners and not conducted with full compatibility of the benchmark suite.